Heavy Rain made with a cheap video recorder is a good way to think of this game. The video footage is blurry on the small screen but in fairness, as a Minis title it has to be a small file size and it’s a lot of footage compressed into 80MB. This ‘interactive (college student-esque) movie’ has you playing as a potential murder victim from a first-person perspective. Everything is shot on camera with no real graphics to speak of. 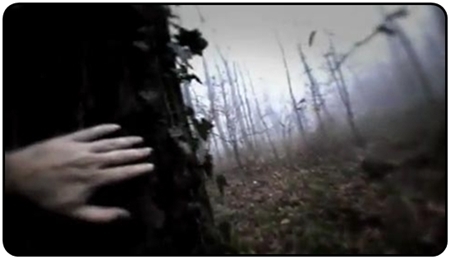 The ‘story’ is simple, escape from captivity and get out of the woods before the hooded axe murderer catches you. You get the feeling this is an idea they had and shot all in the same afternoon before rushing back to the office and splicing in some quick time events. Your input ranges from a choice you need to make such as cutting the tape that’s binding your wrists or look around the room, go left or right, hide or move on. Some are obvious others not so much. You’re really just selecting which video to play next. If you choose the wrong one you’re getting an axe in the skull, which means you’ll have to replay the last few choices to try again. Occasionally you’re asked to press X or O, usually to move some branches or climb over a tripwire. It only really gets tough right at the end, which is less than an hour away. While I loved the basic simplicity of the idea of filming the game as a cheap alternative to forking out on graphics, the tight compression hasn’t been kind to the game. It’s broken it in fact. There are many cases of the sound playing first on a blank screen for ten seconds or so, followed by the film footage without the sound as they’ve been completely torn apart. The blurry picture is forgivable, but this isn’t. The game also crashed on me a few times, just shutting down the PSP. The middle third of the game is annoying as you get lost and are endlessly subjected to the same two videos of a ‘left path’ or ‘right path’. At £1.19 it’s almost worth a punt for curious gamers who’d like to see something a bit different and as an interesting example of what it could develop into with future budget games. Heavy Rain made in a day? The Short Version: As a cheap indie alternative to graphics, I’m all for camera footage to be used instead for ‘interactive movies.’ It’s just a shame that this one is so basic, brief and a bit broken. Let’s hope the budget for the next one is a little bit higher as this sort of title could do well on the PSP if done with more effort.